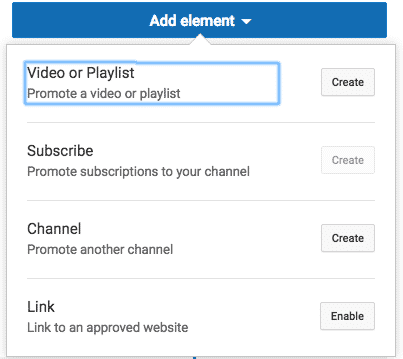 When it comes to online marketing and promotion, nothing beats YouTube. It is an absolute monster in the streaming video sector, and no rival can match them. YouTube has over ONE BILLION users, and hundreds of millions of hours of video are watched every single day, racking up the views (and for some, the profits). Making videos is an art, and if you bear in mind that one hour of video is uploaded to YouTube every second, then you are in for some pretty stiff competition for those eyeballs (and profits). That is why you need to use all of the tools YouTube offers you to promote yourself, and one of them is something called an “end screen”. It’s quite straightforward to set up, and makes your videos look quite cool. 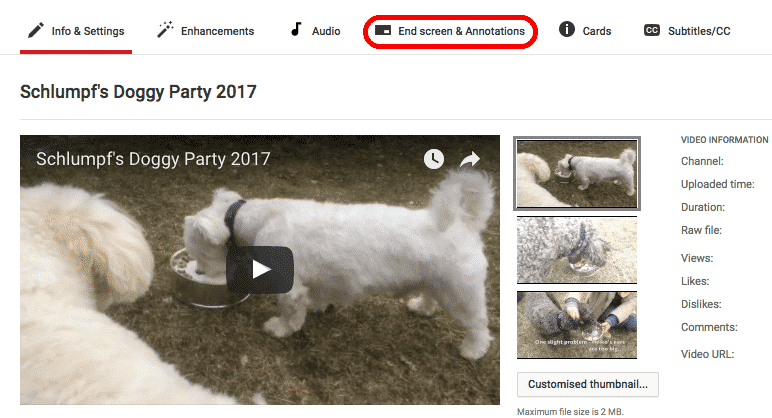 What Is A YouTube Video End Screen? As the word implies, it is the screen you see at the end of the video. The quality varies with each video, depending on the sophistication of your editing software, and how much YouTube gives you to work with (I’m sure high earners get better tools). This is the end screen for MovieClips. The screen is interactive – you can click on movie clips to be taken directly there. 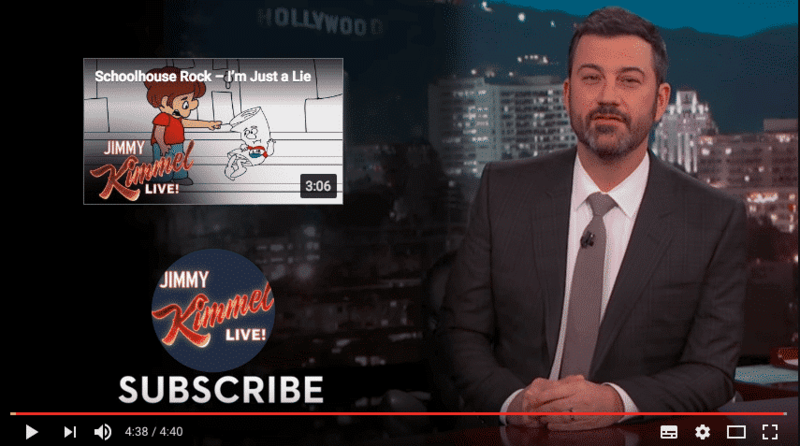 And here’s one from Jimmy Kimmel’s channel, where he asks you to sign up, as well as being able to click on another video. Even if you are not a high-earner on YouTube, bringing in the mega-bucks for Google, you can still make a good-looking screen. YouTube also has a feature called “Cards”, which is similar to end screens, but the difference is that an end screen cannot be on the screen until a maximum 20 seconds before the end of the video. Cards can appear at any point in the video. First you need to upload the video in question to your YouTube channel. Nothing can happen until it’s live. 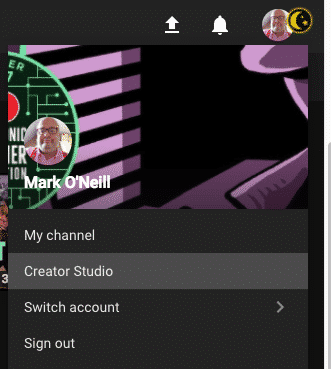 Once the video is there, click on your avatar in the top right-hand corner of YouTube, and select “Creator Studio“. Then click on “Video Manager” at the left-hand side. This will show you your uploaded videos and your analytics. Click “edit” on the video you want to add the end screen to. Now click on “End screen and annotations” at the top. 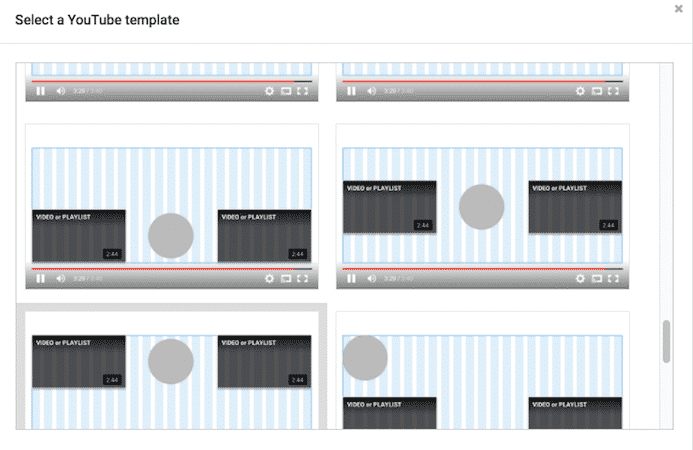 On the next screen, you have the choice of using a pre-made YouTube template, or you can add individual elements. The templates are a nice feature, but to be honest, all they do is suggest places on the screen for the elements to sit. You could easily do that yourself by dragging the elements around with your mouse. So if you drop the “add element” menu down, you will see the 4 options available. You are allowed up to 4 on the end screen, but not necessarily one of each, as you will see. So I chose to promote 2 playlists, promote subscriptions to my channel, and link to my website. 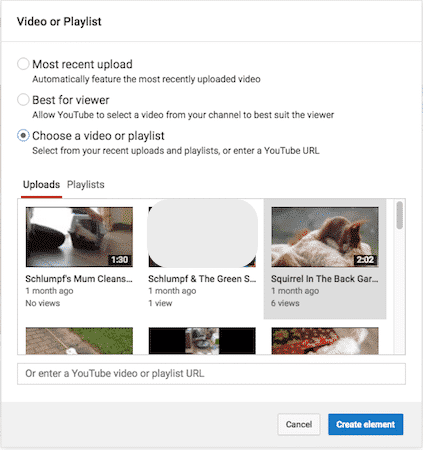 By clicking on “Video Or Playlist”, you are prompted to choose a particular video or playlist. Either your most recent video, one YouTube deems “the best for the viewer” or one of your choosing. They will then appear on your end screen. Choosing this merely puts your Youtube avatar on the screen. The avatar has a link for the person to subscribe. Linking to a website is a bit more involved. First, you have to prove you are the owner of the website. This page has the option to enter the URL, and afterwards, you have to click on the Verify link below. Clicking Verify brings you to this page. There are various verification methods on offer, but the two easiest ones are uploading a HTML file to the website, or copy/pasting a tag into the header of the website. The HTML file one is the easiest in my opinion as you only need a FTP program to upload it to the website’s root folder. Once you have, click on the link in section 3 and if YouTube finds the HTML file where it should be, bam, you’re verified. You only have to do this process once, but to be safe, don’t remove the HTML verification file, even after you have been verified. 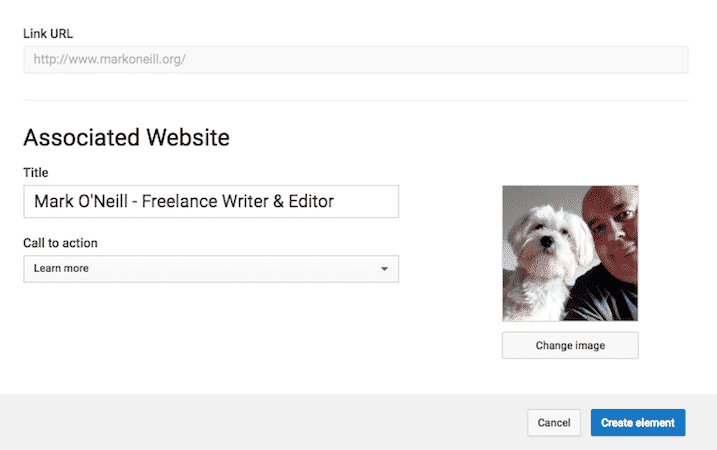 Now you can add your website link to your video end screen. There is a limit on the number of characters in the title, so think clearly about what you want to convey. You can also decide on the “call to action” – in other words, what do you want the person to do? Visit the site? Subscribe to something? Download an app? Once your elements are on the page, you can then move them around with your mouse to get them in the position you want them in. Elements can’t get too close to one another though. If you see a red line between 2 elements, that means they are too close and you need to widen it a bit. This is what my end screen looked like by the end. You can click the preview button above the video screen to see the end of the video and thereby the end screen you have created. Remember to click the “save” button when everything looks fine. You may have to fiddle around with the sliders below the video though. YouTube automatically places your elements at the end of the video, but as I said, you can have them in the last 20 seconds of the video. So to extend their presence, pull the sliders along the timeline with your mouse. This part is not very easy and can rapidly get extremely annoying. So a lot of patience and deep breaths are needed here. As you can see, making a basic screen is not difficult. 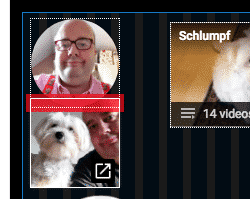 You can also import a video of yourself for the end of the actual video (like the Jimmy Kimmel example above), and superimpose a video onto the screen like that. All it takes is time, patience, and a lot of creativity and imagination.